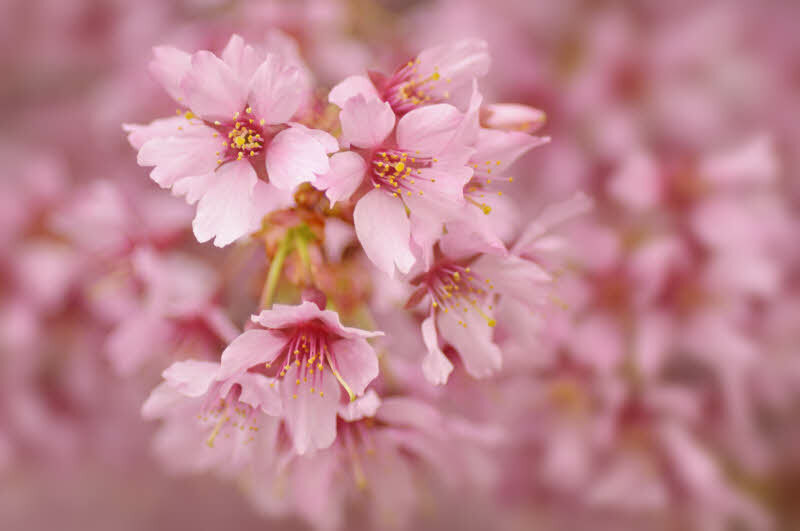 Yesterday I showed a cherry blossom closeup image made with a combination of a Tokina 2.8 50-135 lens combined with a 36mm extension tube. Today I went to same tree. This time I used a Nikkor 75-300 4.5-5.6 lens at 95mm combined with 1.4X teleconverter and a Canon 500D closeup lens. This combination is much easier to use than yesterday’s combo while providing comparable magnification. One thing both approaches share in common is the fact that the focus range (difference between minimum and maximum focus distances) is short – less than a foot. Yesterday’s combo was hard to focus except by moving the camera and then minor fine tuning with the focus ring (forget auto focus). Today’s was more flexible & easier. Gitzo tripod, Nikkor 75-300 4.5-5.6 at 95mm, 1.4X teleconverter, Canon 500D closeup lens, 1/160 sec at f5.0, ISO640, EV0.0, center weighted metering, Aperture priority exposure mode, cloudy warm white balance. Weather – light drizzle and breezy (thus the ISO 640 to help with the moving branches). The whole idea was to slightly separate the main cluster from the background – not easy when everything is basically the same color and tone. Making the main cluster brighter and more “contrasty” is the most realistic option. This entry was posted in Craftsmanship, Focus, Post-Processing and tagged Color Efex Pro, Nik Software, NX2, Photography, Photography How To, Photography Technique, Photography Tutorial, Photoshop, Post processing by Ed Knepley. Bookmark the permalink.